Nothing unites Gibraltar like a good family-friendly event and Ocean Village’s Festival of the Seas certainly proves that to be true. 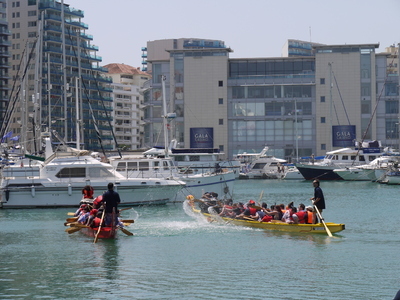 Kicking off last weekend, huge crowds gathered to take part in a wide variety of activities from a Yacht Rally to a Dragon Boat Race and organisers even managed to book spectacular sunny weather. Saturday’s Yacht Rally saw 14 boats set sail at noon to compete across a six-mile course with the almost all-female crew of Seawolf taking the chequered flag for victory and the £800 yacht toolkit prize generously donated by Hire-U-Shop. After much head-scratching and a steward’s enquiry, Ocean Odyssey and Songbird were deemed to have tied for second each receiving meal vouchers courtesy of Savannah´s. Later in the day the Dragon Boat Race was hotly contested by three teams each adopting different race-winning tactics from super soaker water pistols to good old fashioned oar fighting. The Mediterranean Rowing Club came in first, although denied any advantage claiming Dragon Racing was “a completely different type of rowing”, with Hassan’s winning the most creative trophy for quite superb pirate fancy dress. Poker Strategy claimed the booby prize. Other ‘show-stealers’ included water orbing which had children queuing up in their droves to be zipped into a bubble and floated out to sea and high-speed RIB rides made possible by the tireless efforts of the Royal Gibraltar Police Marine Section who put in a six-hour stint in searing heat so as not to disappoint the waiting youngsters. The Royal Gibraltar Yacht Club sailing experiences also went down a treat with many guests setting foot on a sailing yacht for the very first time. Water aside, there was plenty of action on dry land to wow the crowds. Five dance acts put in fun, energetic routines on the main Festival stage (a sneak preview of some of Gibraltar’s entries for the European Showdance Championships in July) as did some incredibly talented singers including ten year old Adam Rocca who opened the show with Bruno Mars’ hit ‘Grenade’ accompanied by some nifty dance moves, Tiffany Ferrary, also ten years old, who records her first album in the UK this summer and Gibraltar’s Got Talent contestants to include winner Sarah Riley. The singing went on deep into the evening. Further music was provided by The Jazz Group of the Royal Gibraltar Regiment Band – an ideal accompaniment to a perfect summer’s day by the sea. Special mention should also go to the various Festival of the Seas competition winners. Despite being almost impossible to judge due to the fantastic entries, five year old Sammy McLeod Rodgers scooped victory in the pirate-themed fancy dress competition making off with beach balls and a party bag whilst Liam Baldacchino won a fine selection of art materials presented by the Minister for Culture for his detailed acrylic painting in the Ocean Village Outdoor Painting Competition organised by local artist Giorann Henshaw. As the weekend progressed Esprit and Aftershock put on a stunning fashion show modelling their summer collection, little girls became princesses with mini makeovers and the score-a-goal challenge proved to be incredibly popular. All the time Captain Jack Sparrow, Hello Kitty and Clarence the Clown mingled with the crowds and dished out lollipops to eager little hands. The Festival of the Seas culminates this weekend with the Gibraltar Classic Vehicle Association’s mini Rally around the Rock concluding at Ocean Village on Saturday 21 May and, the highlight, a breathtaking aerobatic display from The Blades on Sunday 22 May brought courtesy of Barclays Wealth and Bwin.party. A full programme of activities can be found at oceanvillage.gi/events.html or on the Ocean Village Official Facebook Site. For more information on The Blades in Gibraltar visit theblades.biz. For “Meal & Show” Tickets call Ipanema on 00 350 216 48888 or email info[at]ipanema-restaurant.com.